UPDATE: As of 5.30 today, all the protesters have been evicted from the site. 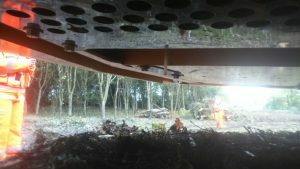 Protesters opposed to the destruction of parts of the Colne Valley Park, a nature reserve on the outskirts of London, have halted the felling of trees by HS2 Ltd by camping out underneath a digger. 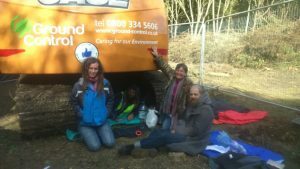 Five protesters now occupy land on Harvil Road in Harefield after one initially stopped work by getting herself underneath one of the construction vehicles. The protesters believe the work HS2 Ltd are currently undertaking is illegal as they do not have the necessary licenses from Natural England to disturb the habitats of protected species. At around 11am on Monday 2nd October, local resident Sarah Green saw that trees were being cleared from a site off Harvil Road outside of Harefield, and immediately entered the site where she crawled under a digger. 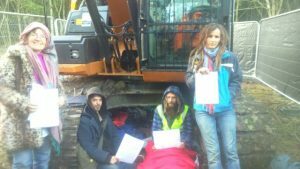 Overnight, she was joined in the compound by four other protesters, in what is expected to be the first of many direct actions against HS2. Trees are being cleared from the site as part of preparatory work, as they are making way for a temporary construction road. A tarpaulin been erected around the site meaning it is now not viable from the road and bailiffs have arrived. Police have since confirmed that two arrests have been made. Witnesses at the scene say the people arrested were attempting to get food to the protesters inside the compound. The occupiers have vowed to go on for as long as possible. Well done to the protesters . This is corporate vandalism at work again . We should all be prepared to defend our local environment from the excesses of HS2. Warwickshire is going to suffer hugely from this unwanted project and I hope people come out in force .